SAMHSA and the entities they fund have made ‘fighting stigma’ a major focus. 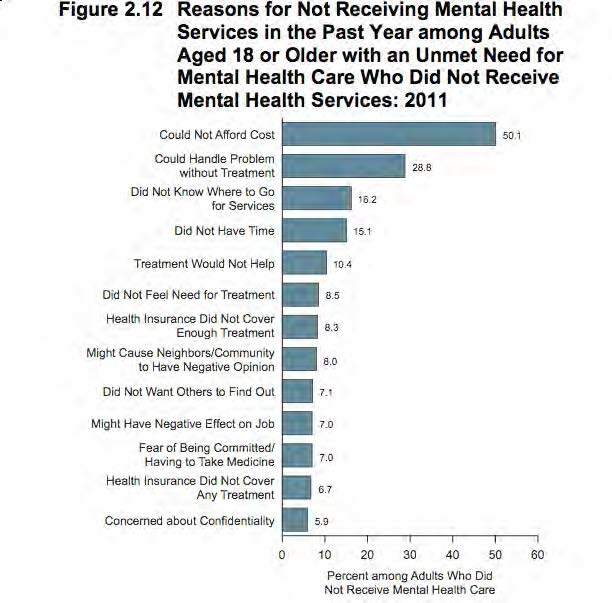 SAMHSA conducted research on why people do not receive treatment and stigma is only a tiny part of that. Much more significant barriers were cost (another way of saying treatment not available) and failure to recognize need for treatment, inefficacy of treatment. SAMHSA and the entities they fund also point to ‘fear of commitment’ as being a major reason people don’t seek care. Again, their own research shows that is minor. If stigma were an important reason people don’t get care, then as Dr. E. Fuller Torrey has written, the best way to reduce stigma is to reduce violence by people with untreated serious mental illness. It is violence by this small minority that tars the non-violent majority.